When Life Happens, Live It! Today I just want to talk to you for a second. About a year and a half ago when I really got serious about blogging, I made a promise to myself that I would blog three times a week. Period. I wanted to be consistent, to be taken seriously. And that’s what I did. I posted a new recipe on Mondays, “What I Ate Wednesday” on Wednesdays, and either something topical or another recipe on Thursdays. That’s just how it was. Then last week came along and guess what? I didn’t post on Thursday. Then I didn’t post on Friday, either. And then I realized something. I don’t want to be a slave to the internet. I never wanted this space to be stressful. It’s supposed to be my creative outlet, my way of giving back. So why am I putting pressure on myself to meet some silly standard that doesn’t even exist? Life HAPPENS. We get STRESSED. We get BUSY. We get EXCITED. We’re LIVING. The second Alchemy is opening in less than two weeks. I’m stressed, I’m busy, I’m excited, and I’m sure as hell living! Last Wednesday my friends asked me if I wanted to get dinner and drinks at Columbus’ new Guild House and my immediate thought was “shoot, I still haven’t done tomorrow’s blog post.” Then I stepped back. I realized how ridiculous I sounded, that I was about to turn down an invitation to drink good wine and eat great food with fabulous friends because I hadn’t photographed the freaking chickpea salad. What the hell is wrong with me? Having a blog that doubles as a job really blurs the line sometimes. There’s pressure. People depend on you. It’s expected that you’ll post pretty food and write funny things each and every week. But it’s also your job to have a life, to keep some sliver of sanity, and to practice what you preach. I preach balance, and now I’m going to practice it. I’m going to have a glass of wine even if tomorrow’s post isn’t finished. I’m going to enjoy a long, lazy brunch even if I signed up for a workout class. I’m going to stay out late drinking vodka sodas even if I haven’t responded to the last two hundred comments. It can wait. All of it. At the end of the day, I love you all and this blog more than anything and we all know that. But if I’m spending all my “free” time working working working working and then working a little more, no one’s happy. Not me, not you, not the chickpeas. So if I suddenly don’t post, don’t worry. I’ll always be here. This space is only going to get bigger and better. I can promise you that. But if I’m gonna do this, if I’m gonna make Hummusapien all it can be, I want to do right. I want to do it with a smile on my face. I want to always have that warm and fuzzy feeling I get when l nail recipe that I know you’re gonna love or when I think of something hilarious to say on my way home from work. I don’t want it to be forced. I don’t want to blog just because it’s Thursday. So on this beautiful Monday, I don’t have a recipe for you. All I have are some wise words. Don’t push your passion over the edge. Don’t accidentally turn what you love into something you don’t. Do you and rock it. Embrace your inconsistencies. Anyone who matters will love you for it. I can promise you that. AMEN! Live life so you enjoy this blog and space versus resenting it! AMEN TO THIS. I go back and forth with myself constantly, but I often find that if my post isn’t prepped by like 7 pm the night before, I opt for dinner/drinks/lots of TV watching instead. It just gets too stressful otherwise and it’s generally not worth it. That’s so exciting! Amen to this post. Balance is so important and sometimes so hard to find or make time for! Yes to all of this, Alexis! I want to add that you are young and single and you won’t get these “carefree” years back, so definitely don’t turn down the invitations to get drinks with friends. I look back at those years fondly because I definitely didn’t turn down those invites. ;-) Now I sound like an old lady! Ha! But now days my life happens, so live it moments are “I was up all night with my daughter who had a terrifying nightmare about dinosaurs, so….getting up at 5:30 am to write my blog post ain’t happening.” But those moments of laying in bed with my girl are precious, too. :) Sorry for the rambling comment! Yes, yes, yes! You are absolutely right! I love it Alexis! What an epiphany! It leaves all of us totally “piffed off”! Thank you for great taste of the truth. I needed this post. I’m in college so OBVIOUSLY life happens (especially the alcohol part), and though I strive to maintain a healthy life and be 100% on top of everything, it’s incredibly hard! Especially when I see all these fitness and food bloggers who seem to have it all together, never drinking/missing a workout/always eating healthy. That’s just not how life works, man! Good for you! Finding balance can be a struggle, but so worth it in the end. Enjoy and embrace all those little moments because that’s what life’s all about! Other things that are important: sleep ;) When I find myself trying to get a blog post in after my bed time, I remind myself that no one will really notice if a recipe isn’t up exactly at the same time as others. Exciting to hear about Alchemy 2 – you guys are rocking it and I love hearing about how you’re finding balance between all these exciting projects and lady time. i love you. a whole lot. and real talk? i actually like the inconsistent, messy, imperfect you WAY better than the “perfect” eating, fitness barbie, have-it-all-together you. i can relate to messy, imperfect, stressed, uncertain humans. and i sure as hell never want this blog to turn into something that doesnt bring a smile to your face. so slug back that wine and screw it (you know i totally wanted to drop the F bomb there) — hummusapien is the jam because you are honest and true and your passion comes through. boop oop E doo. and you know what? i cant always read your post on the exact day you post it because your readers are busy too. post what you want, when you want, because it will come from an inspired, creative and caring place. and that’s who you are and why we love this blog so much. maybe me more than anyone. do you know what a HUGE (like huuuuuuuugggeeeeee) part of my life this blog and you have been over the past 1.5 years? one of the most important, influential, inspiring, and life-changing. dont forget that. i love this post, i love hummusapien, i love chickpeas, and i love you. XO. Love this :) I think some people forget it all too often! Hope you had a great weekend! Darn right!! Enjoy life and take care of you! And don’t take your time to respond to this. Balance is a tough thing!! I already texted you my thoughts on this… but seriously, AMEN! Thanks for the inspiration/encouragement! You’re so welcome, Hannha :) I’m glad it resonated with you. I’ve had very similar thoughts lately and even wrote something similar last night.. keep doing YOU and enjoy life! It’s the only one we have! I’m so with you on this. I recently had the similar feelings; my blog was getting to be redundant and I didn’t feel like writing a post simply for the sake of having one written. Life is happening and I’m figuring it out. This is such an exciting time for you. Enjoy it! Thanks friend! I’m glad you can relate. I think we all can in some way or another. Balance is much easier said than done. LOVE THIS. 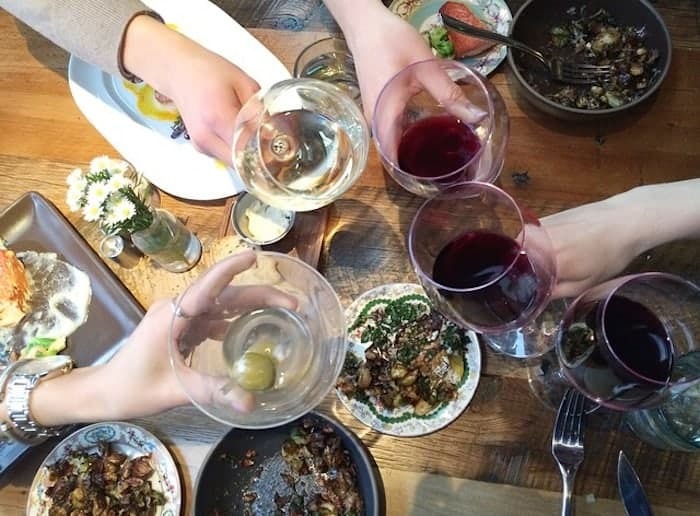 There is ALWAYS time for friends, wine, memories, vodka sodas, and boozy brunches. Fully on board with this. Mmmmm boozy brunches yes PLEASE. Spot on per usual! You rock my socks off. Yes! Yes! Yes! On point…SO well said!!! Amen girl! Since starting a full time job I’ve had the same thought about blogging. It’s part of my life but I never want it to BE my life. And if that means posting only once a week or even less frequently, then so be it. Glad to hear you’re enjoying life too! Sometimes I do feel like blogging IS my life rather than PART of it. Isn’t that crazy?! Amen, sister! True words of wisdom from someone so young… I can say that coz I’m an old lady, haha! ;) Seriously, it is really true… don’t be a slave to something you created. You own it, it doesn’t own you. We know you will always be here, just like we will always be here for you too. And we can always wait for the next awesome recipe. :) You rock, girl! Yes! Blogging is such a tricky job/hobby/whatever. I just try to keep in mind that having life experiences will give me more to blog about or fuel my creativity. There always has to be a balance. I’m glad you’re having some fun despite being so busy, though! It’s so important! Very true! Nothing good in life comes easy, right? This rules! Thanks for being you and providing us with yummy food and making me feel better about those times I stay out too late when I should be doing other things (hey, there, exams…..). We’ll always be here reading! This is why I needed to start a new blog; my old one was being a negative part of my life that I just didn’t need. THANK YOU for sharing your honest thoughts. Good for you for getting rid of the negativity! “Having a blog that doubles as a job really blurs the line sometimes.” I couldn’t agree more. Well said and a great reminder that it’s just as important to have a life too! Thanks, Jessica! It’s great to be surrounded by people who understand the difficulty of that balance. just wanted to do a shout out to this post – thank YOU!!! I can relate to so much, as a fellow blogger! Thanks, Ashley! I’m glad I opened up about it. Feels great! I love this so much. I sometimes feel guilty for not posting, but then I stay out a little later (or study a little more). And then I make memories that I can blog about (or not). I think it’s important to remember that my blog is mine – I get to manage it, but it shouldn’t manage me. This is perfect. I can totally relate to this post. Sometimes for me its working out, resting or reading that I choose to do over my blog because those things are important to me too in addition to my 9-5 day job. Thanks for sharing! As a fellow must-post-three-days-a-week blogger, I needed to hear this today. Thank you. Catching up on your posts now and love this one! i haven’t posted anything for a little while because life. I definitely see where you are coming from. And CONGRATS on the second Alchemy!! Hi, I’ve never been to your blog before — I found it through a link on a friend’s space — but I have to comment because this is…exactly what I’ve been feeling lately. You nailed it, and I’m so glad you put these words out into the world. It’s good to hear that this resonated with you. I wasn’t sure if I should post it, but I’m really glad I did! Agree with you about preaching balance. Blogging is a job nowadays it is harsh realities. Btw found your post from Pinterest, thanks for sharing. It really is crazy. Glad you found me! Magnificent website. A lot of helpful information here. I’m sending it to a few pals and also sharing in delicious. And of course, thank you for your effort!